The Teves Mark IV Anti-Lock Brake System (ABS) consists of acceleration switch, Controller Anti-Lock Brake (CAB), ANTI-LOCK warning light, Hydraulic Control Unit (HCU), main relay, master cylinder, pedal travel sensor, pump motor relay, pump motor sensor, vacuum booster, 4 wheel speed sensors and axle shaft tone (pulse) rings. individually and rear wheels are controlled together. ABS modulates brake fluid pressure during high pedal pressure and high vehicle deceleration to prevent wheel lock-up. NOTE: For more information on brake system, see BRAKE SYSTEM article in this section. The Teves Mark IV Anti-Lock Brake System (ABS) is activated during hard braking to prevent wheel lock-up. Wheel lock-up does not mean wheel has stopped, but wheel is turning slower than vehicle speed. When ignition is on, before vehicle is moved, Controller Anti-Lock Brake (CAB) performs a static system initialization. When vehicle speed reaches approximately 6 MPH, CAB briefly cycles pump to verify operation. Hydraulic Control Unit (HCU) solenoids are checked continuously. When ABS is activated, vibrations and pulsations may be felt in brake pedal and solenoid valves clicking and pump motor running may be heard. Some wheel slip is required for best braking performance. This wheel slip may be heard as tire chirping. Do not confuse tire chirping with tire skidding. When vehicle is braked heavily, wheels will lock-up below 3 MPH. When braking on rough road surfaces, ABS may activate, detecting wheel lock-up tendencies from wheel hop. CAUTION: See ANTI-LOCK BRAKE SAFETY PRECAUTIONS article in GENERAL INFORMATION. NOTE: Use only DOT 3 brake fluid from a sealed container. DO NOT use DOT 5 silicone brake fluid. hydraulic control unit brakeline fittings individually. air escapes from brake pipe fitting. Repeat procedure for remaining 3 brakelines. NOTE: DO NOT pump brake pedal while bleeding brakes. Pumping brake pedal compresses air into tiny bubbles throughout system making bleeding more difficult. cylinder/caliper housing to free trapped air. Close bleeder valve. procedure on left rear, right front and left front bleeder valves. repeat steps 1)-5). Ensure master cylinder reservoir is full. See REAR WHEEL SPEED SENSOR under REMOVAL & INSTALLATION. 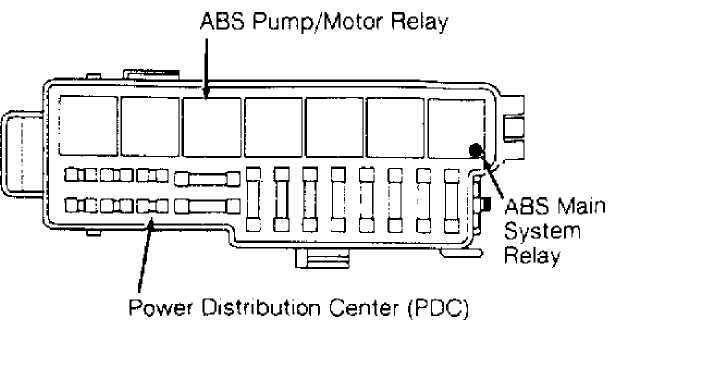 ABS main system relay is located on right side of engine compartment in Power Distribution Center (PDC). Turn ignition off. Remove cover from PDC. Locate and remove ABS main system relay from PDC. See Fig. 1. To install, reverse removal procedure. Fig. 1: Locating ABS System Relays Courtesy of Chrysler Corp.
ABS pump/motor relay is located on right side of engine compartment in Power Distribution Center (PDC). Turn ignition off. Remove cover from PDC. Locate and remove ABS pump/motor relay from PDC. See Fig. 1. To install, reverse removal procedure. Turn ignition off. 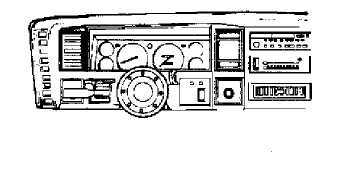 CAB is located under instrument panel to right of steering column. Remove screws attaching CAB mounting bracket to vehicle. Disconnect CAB electrical connector. Disconnect security alarm module electrical connector. Security alarm module is mounted on opposite side of mounting bracket. Remove CAB and mounting bracket. See Fig. 2. To install, reverse removal procedure. If installing a new CAB, transfer mounting bracket to new CAB. Fig. 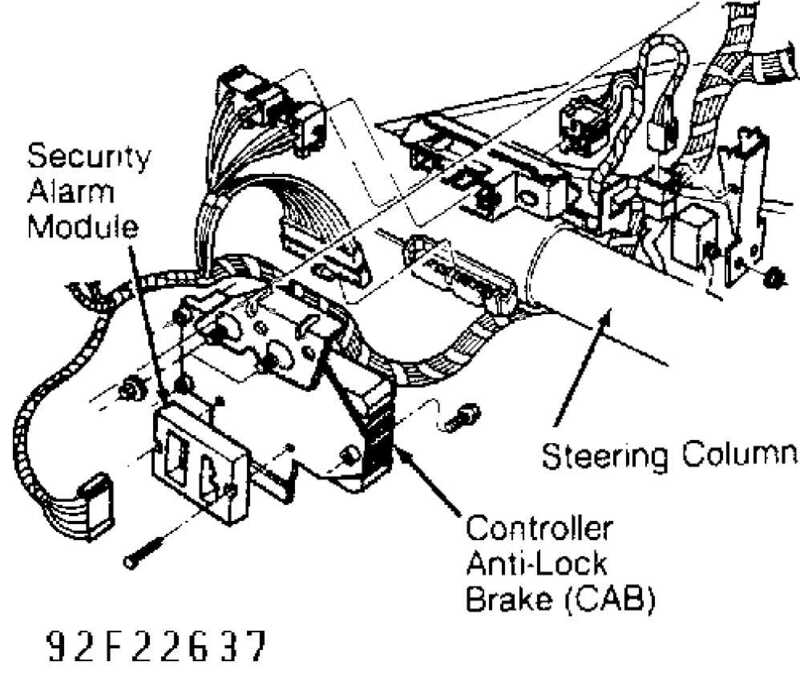 2: Locating Controller Anti-Lock Brake (CAB) Courtesy of Chrysler Corp. CAUTION: DO NOT force CAB electrical connector onto CAB. CAB pins are easily damaged. Removal & Installation (Grand Cherokee & Grand Wagoneer) Turn ignition off. Disconnect negative battery cable. CAB is located on driver-side inner fender panel. Remove screws attaching CAB to fender panel bracket. Remove CAB from bracket for access to CAB electrical connector. Release strap securing harness connector to CAB. Tilt CAB electrical connector upward to disengage. Slide CAB electrical connector from retaining tangs. Remove CAB from vehicle. To install, reverse removal procedure. the right of the battery. tangs. Remove CAB from vehicle. To install, reverse removal procedure. removal. Remove bolt attaching wheel speed sensor to steering knuckle. steering knuckle. Use Loctite on wheel speed sensor mounting bolt. wheel speed sensor and/or tone wheel may be necessary. Turn ignition off. Disconnect negative battery cable. Tilt rear seat assembly forward to access "G" switch. Disconnect "G" switch electrical connector. Remove "G" switch mounting bolts. Remove "G" switch. See Fig. 3. To install, reverse removal procedure. Ensure arrow on top of "G" switch is facing toward front of vehicle. Fig. 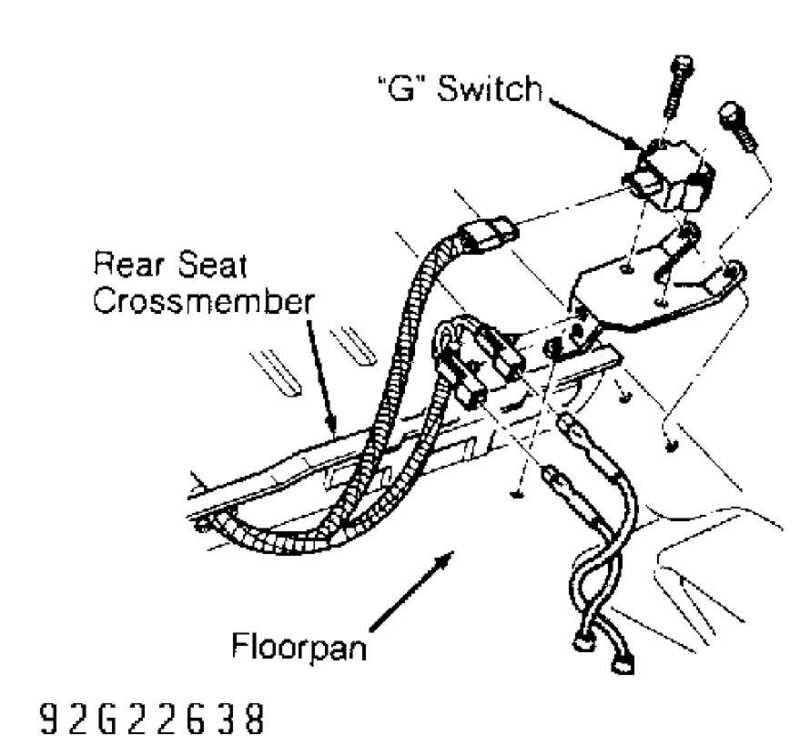 3: Locating "G" Switch (Typical Except Wrangler) Courtesy of Chrysler Corp. Turn ignition off. Disconnect negative battery cable. Move driver’s seat assembly forward or rearward to access "G" switch. Disconnect "G" switch electrical connector. Remove "G" switch mounting bracket-to-floorpan screws. Remove "G" switch from mounting bracket. See Fig. 4. To install, reverse removal procedure. Ensure arrow on top of "G" switch is facing toward front of vehicle. Fig. 4: Locating "G" Switch & CCD Connector (Wrangler) Courtesy of Chrysler Corp. Turn ignition off. Disconnect negative battery cable. Fig. 5. Discard fluid. Disconnect HCU electrical connectors. vehicle. To install, reverse removal procedure. Bleed brake system. Fig. 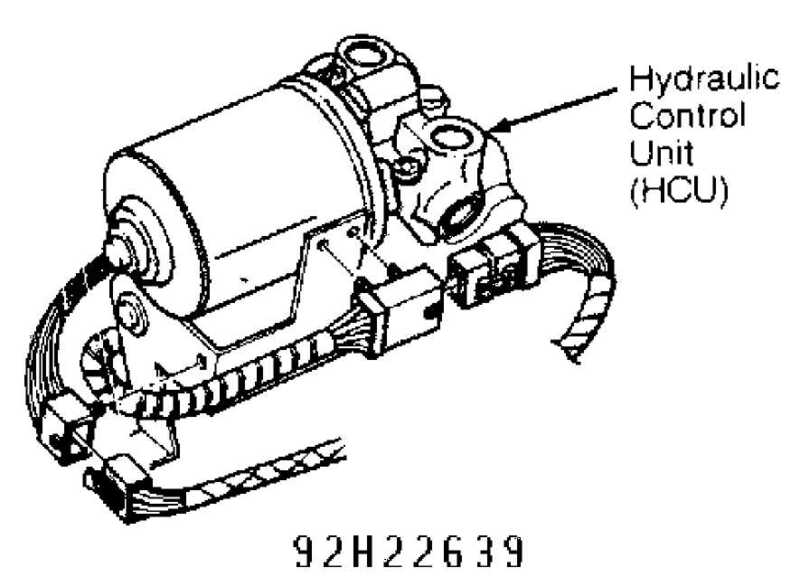 5: Locating Hydraulic Control Unit (HCU) Courtesy of Chrysler Corp. Turn ignition off. Disconnect pedal travel sensor electrical connector. Pump brake pedal to exhaust all vacuum from vacuum booster. Unseat pedal travel sensor retaining ring. 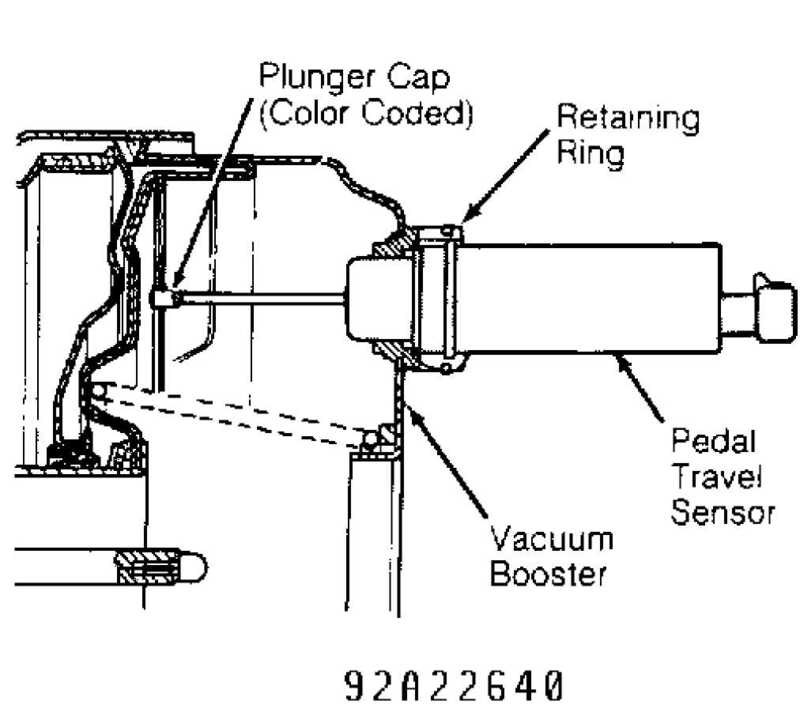 Remove pedal travel sensor from vacuum booster. See Fig. 6. To install, reverse removal procedure. Ensure color dot on face of vacuum booster matches color of plunger tip. If colors are different, replace plunger tip to match color dot on vacuum booster. Fig. 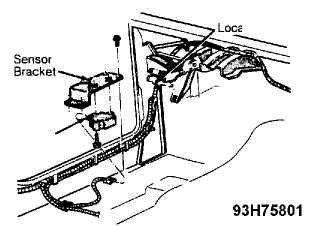 6: Locating Pedal Travel Sensor Courtesy of Chrysler Corp.
harness through floorpan on vehicle. Raise and support vehicle. Remove wheel and brake drum. wheel speed sensor from vehicle. wheel speed sensor until cardboard spacer contacts tone wheel. Use Loctite on the wheel speed sensor mounting bolt. TORQUE SPECIFICATIONS. Spin rear axle by hand until cardboard spacer is peeled from sensor face. Air gap adjustment should be correct. Using a brass feeler gauge, check air gap adjustment. Air gap should be .043" (1.1 mm). If air gap is not correct, adjust as necessary. Go to step 4). Remove any remaining pieces of cardboard from sensor face. on brakelines. To complete installation, reverse removal procedure. After engine start-up, ABS warning light glows as part of a self-check feature. ABS warning light normally will light for 2-3 seconds and then go out. If ABS warning light remains illuminated after engine start-up, diagnosis will be necessary to determine which component or circuit is malfunctioning. With ignition on, Red BRAKE warning light will glow when low brake fluid level is detected or parking brake switch is closed. BRAKE warning light normally indicates a hydraulic or mechanical failure is present. Check master cylinder reservoir for correct fluid level. Inspect Hydraulic Control Unit (HCU) for leakage and wiring damage. Check speed sensors for correct mounting and alignment. damaged and have good contact. wobble. Ensure all tires are in good condition and properly inflated. SELF-DIAGNOSTIC TESTS using DRB-II. See Figs. 4, 7 and 8. Fig. 7: Locating CCD Connector (Cherokee) Courtesy of Chrysler Corp. Fig. 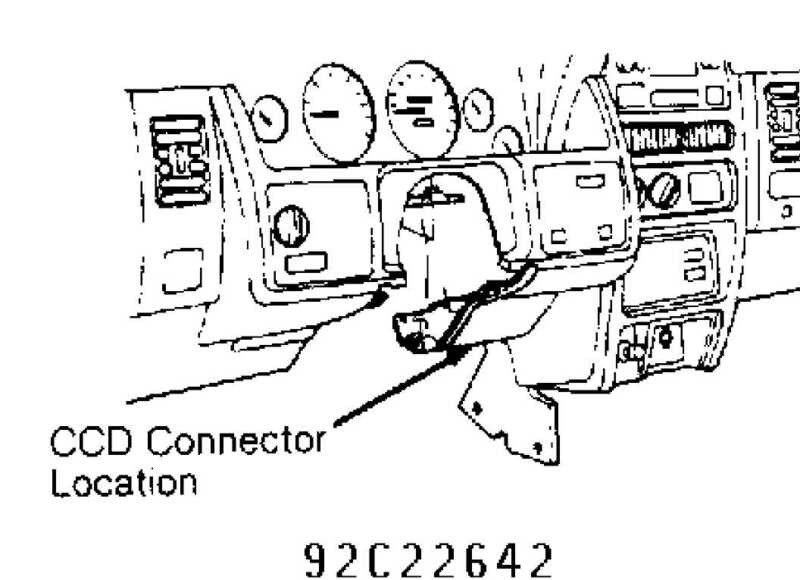 8: Locating CCD Connector (Grand Cherokee & Grand Wagoneer) Courtesy of Chrysler Corp.
fully seated in connector body (backed-out). Check for poor terminal-to-wire connection. Check for hydraulic system leaks. ERASE FAULTS FAULTS ERASED. Faults are now erased. 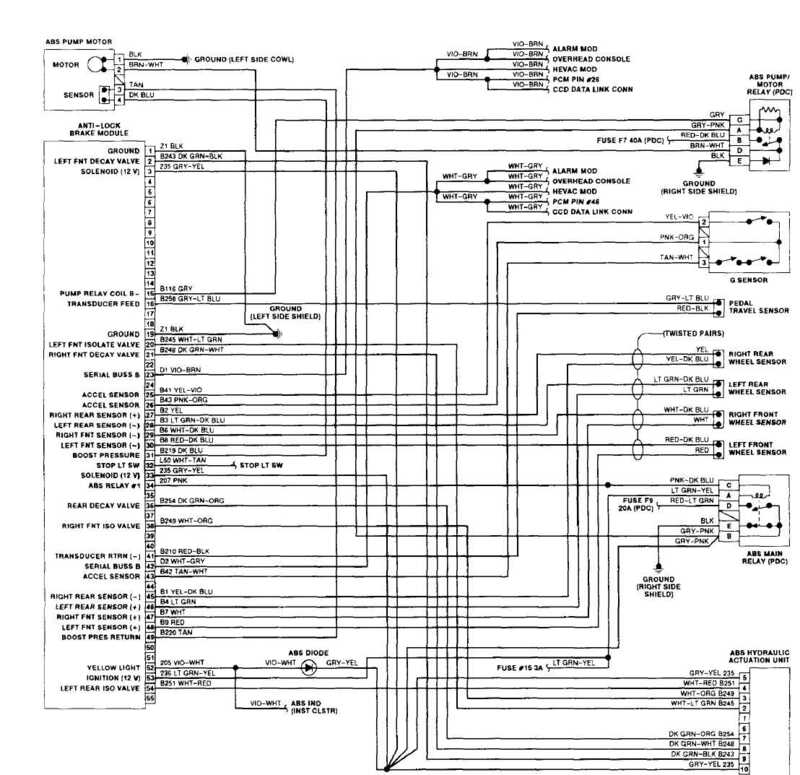 If no fault codes occur for 50 driving cycles, any existing fault messages will be cleared from CAB memory. A drive cycle occurs when ignition is turned on and vehicle is driven faster than 10 MPH. Fig. 9: Identifying ABS Disconnect Connector Terminals Courtesy of Chrysler Corp. Fig. 10: Identifying ABS Main System Relay Connector Terminals Courtesy of Chrysler Corp. Fig. 11: Identifying ABS Pump/Motor Relay Connector Terminals Courtesy of Chrysler Corp. Fig. 12: Controller Anti-Lock Brake (CAB) Connector Terminal ID Courtesy of Chrysler Corp. Fig. 13: Identifying "G" Switch Connector Terminals Courtesy of Chrysler Corp. Fig. 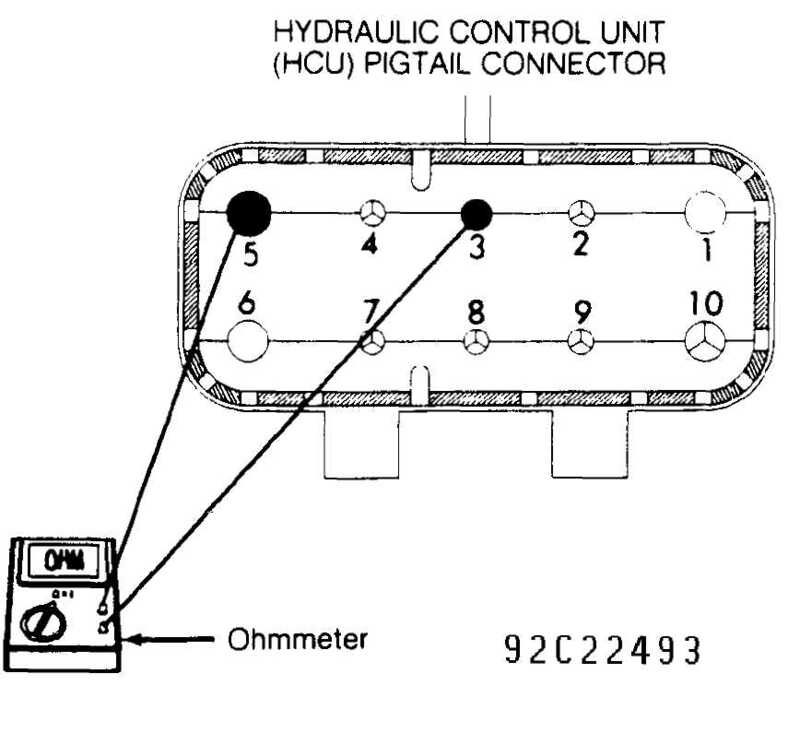 14: Hydraulic Control Unit (HCU) Connector Terminal ID Courtesy of Chrysler Corp. Fig. 15: Identifying Pump/Motor Connector Terminals Courtesy of Chrysler Corp. 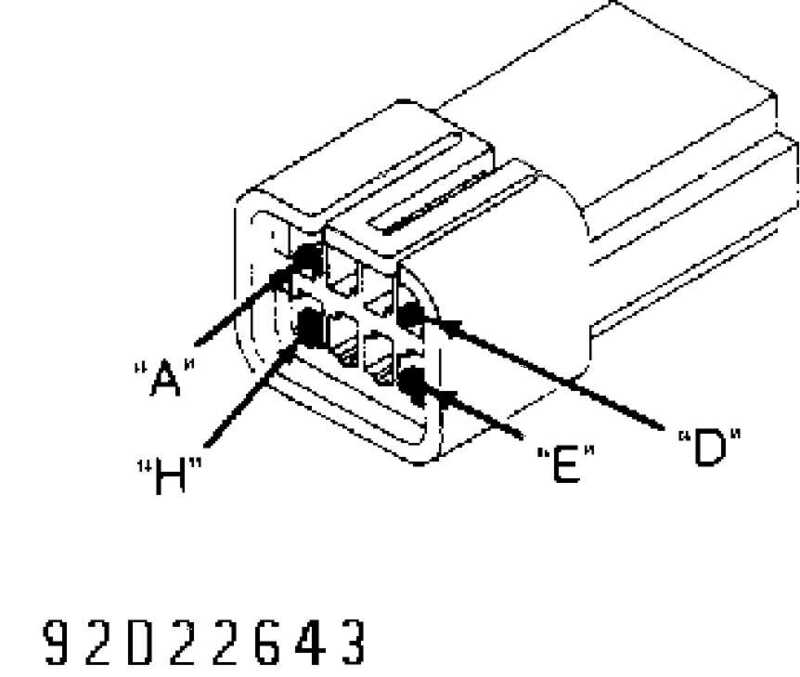 NOTE: Connector and terminal identification illustrations in following tests are provided courtesy of Chrysler Corp.
see CONNECTOR IDENTIFICATION under DIAGNOSIS & TESTING. 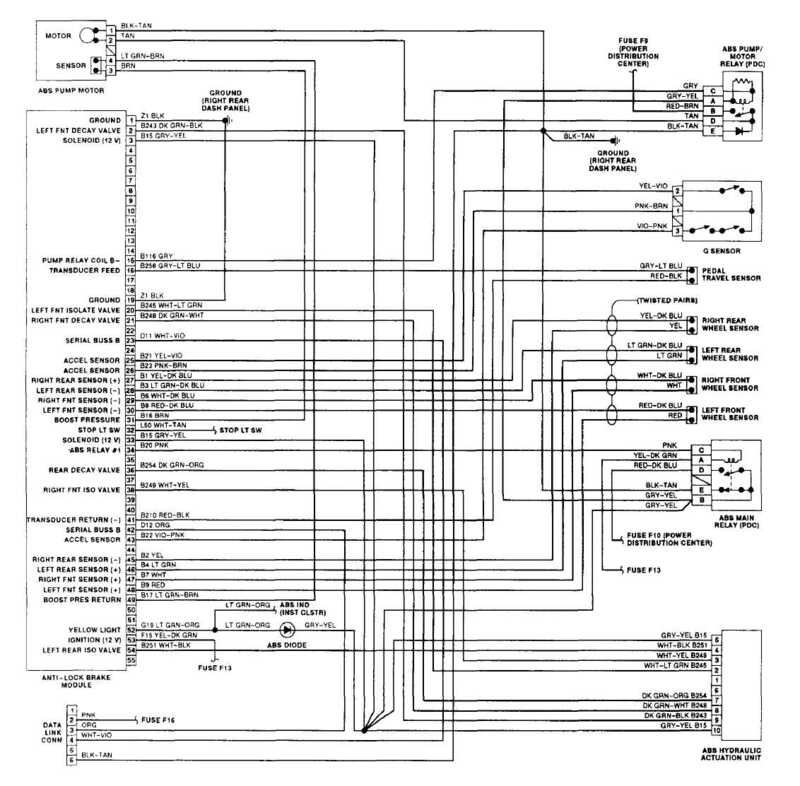 For wire color and terminal identification, see WIRING DIAGRAMS. Using DRB-II, read fault messages and perform appropriate test listed in FAULT MESSAGES table. If DRB-II displays NO RESPONSE message, perform TEST 23A. 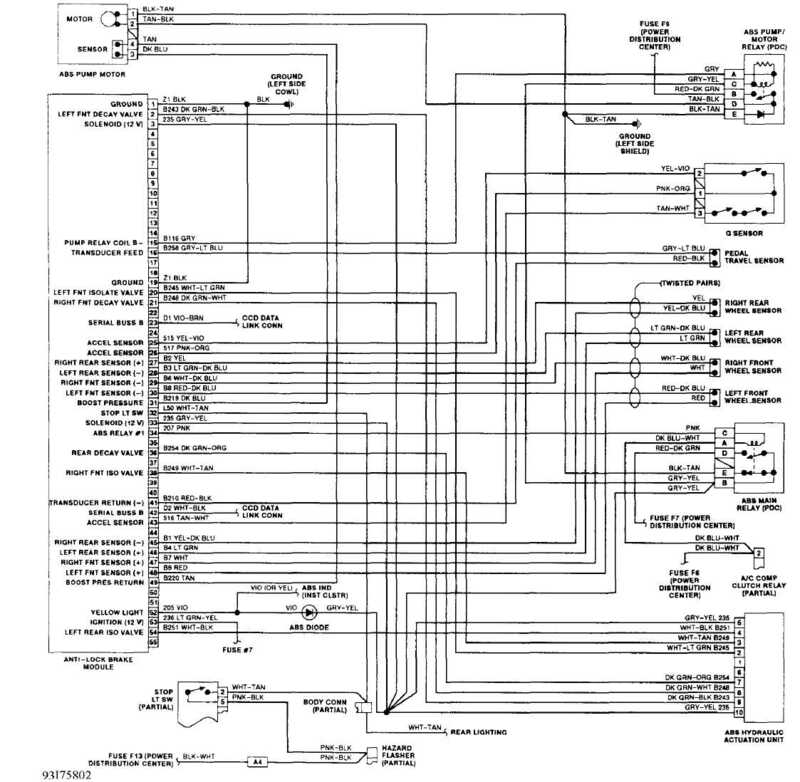 If other DRB-II related communication problems exist, see VEHICLE COMMUNICATIONS article in ENGINE PERFORMANCE. If multiple fault messages are present, fault repairs must be performed in order in which they are displayed. If no fault messages are present, perform VERIFICATION TEST VER-1A. If DRB-II displays CONTROLLER FAILURE, replace Controller Anti-Lock Brake (CAB). Perform VERIFICATION TEST VER-1A. Ensure "G" switch sensor assembly is properly installed. ignition off. Disconnect and inspect CAB 55-pin connector and "G"
switch sensor 3-pin connector. Repair connectors as necessary. Turn ignition on. With DRB-II in voltmeter mode, probe "G"
VER-1A. If voltage is not present at any terminals, go to next step. Turn ignition off. With DRB-II in ohmmeter mode, probe "G"
connect jumper wire between ground and "G" switch terminals No. 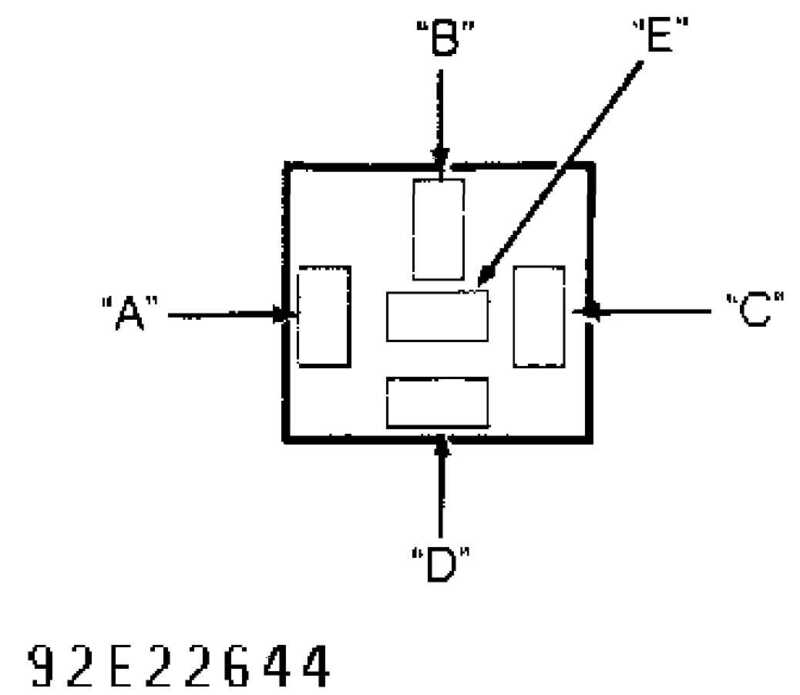 1-3.
continuity to ground does not exist, repair open in that circuit. replace CAB. Perform VERIFICATION TEST VER-1A. necessary. If brake system is okay, using DRB-II, read fault messages. If DRB-II displays PUMP/MOTOR NOT WORKING PROPERLY, perform TEST 15A. 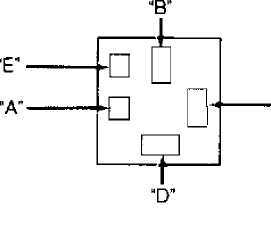 TRAVEL SENSOR CIRCUIT, using DRB-II, erase fault messages. Using DRB-II, monitor read faults display for 4 minutes. instructed to release it. Using DRB-II, actuate hydraulic valve test. been replaced, replace HCU. Perform VERIFICATION TEST VER-1A. pushed out, damaged or improperly wired, replace hydraulic control unit. Perform VERIFICATION TEST VER-1A. Disconnect and inspect hydraulic unit 10-pin connector. voltage in White/Light Green wire. Perform VERIFICATION TEST VER-1A. short to ground in White/Light Green wire. resistance is more than 5 ohms, repair open in White/Light Green wire. left front inlet valve. If resistance is 5-8 ohms, replace CAB. replace hydraulic control unit. Perform VERIFICATION TEST VER-1A. voltage in Dark Green/Black wire. Perform VERIFICATION TEST VER-1A. short to ground in Dark Green/Black wire. Dark Green/Black wire between terminals No. 2 of CAB connector and No. resistance is more than 5 ohms, repair open in Dark Green/Black wire. resistance is 3-5 ohms, replace CAB. Perform VERIFICATION TEST VER-1A. VERIFICATION TEST VER-1A. If sensor is okay, turn ignition off. in ohmmeter mode, probe terminal No. 48 (Red wire) of CAB connector. If resistance is less than 5 ohms, repair short to ground in Red wire. disconnect and inspect left front wheel speed sensor connector. sensor connector using an external ohmmeter. If resistance is more than 5 ohms, repair open Red wire. repair open Red/Dark Blue wire. Perform VERIFICATION TEST VER-1A. sensor is okay, check left front sensor tone (pulse) ring for damage. VERIFICATION TEST VER-1A. If wiring harness is okay, disconnect and inspect left front wheel speed sensor connector. Repair connector as necessary. Using an external ohmmeter, check resistance between left front wheel speed sensor connector terminals. ohms, replace CAB. Perform VERIFICATION TEST VER-1A. surfaces or during off road use, it is possible for a wheel speed sensor to set a code. and inspect CAB 55-pin connector. Repair connector as necessary. With DRB-II in ohmmeter mode, probe terminal No. 4 of hydraulic unit connector. If resistance is less than 5 ohms, repair short to ground in White/Black or White/Red wire. Perform VERIFICATION TEST VER-1A. VERIFICATION TEST VER-1A. If resistance is 5-8 ohms, replace CAB. voltage in Dark Green/Orange wire. Perform VERIFICATION TEST VER-1A. short to ground in Dark Green/Orange wire. resistance is more than 5 ohms, repair open Dark Green/Orange wire. VERIFICATION TEST VER-1A. If resistance is 3-5 ohms, replace CAB. messages. If DRB-II does not display LEFT REAR SENSOR CIRCUIT FAILURE, perform TEST 12A. If DRB-II displays LEFT REAR SENSOR CIRCUIT FAILURE, inspect left rear wheel speed sensor for damage. If sensor is damaged, repair or replace sensor as necessary. Perform VERIFICATION TEST VER-1A. If sensor is okay, turn ignition off. voltage is present, perform TEST 11B. (Light Green/Dark Blue wire) of CAB connector. replace wheel speed sensor. Perform VERIFICATION TEST VER-1A. perform TEST 11D. If resistance is less than 5 ohms, perform TEST 11E. probe Light Green wire of ABS disconnect connector. Green wire of ABS disconnect connector. On Cherokee and Wrangler, repair open in Light Green wire. Wagoneer, disconnect and inspect Black CAB 8-pin disconnect connector. 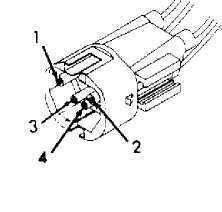 Green wire between wheel speed sensor and ABS disconnect connector. CAB 55-pin connector. Perform VERIFICATION TEST VER-1A. tone ring as necessary. Perform VERIFICATION TEST VER-1A. rear wheel sensor-to-tone ring clearance. If clearance is not .036-. 050" (.91-1.27 mm), repair as necessary. If clearance is .036-.050" (. wheel speed sensor wiring harness for damage. Check ABS system fuse in Power Distribution Center (PDC). displayed, replace ABS main relay. Perform VERIFICATION TEST VER-1A. (Red/Light Green on Grand Cherokee and Grand Wagoneer) wire to ABS fuse in PDC. Perform VERIFICATION TEST VER-1A. main relay. Perform VERIFICATION TEST VER-1A. connector. Repair connector as necessary. Using an external ohmmeter, measure resistance of ABS pump/motor relay coil. See Fig. 16. If resistance is 35-65 ohms, go to next step. If resistance is not 35-65 ohms, replace ABS pump/motor relay. Perform VERIFICATION TEST VER-1A. ground. Perform VERIFICATION TEST VER-1A. If resistance is more than 5 ohms, go to next step. (blows), replace hydraulic control unit. Perform VERIFICATION TEST VER-1A. time. Perform VERIFICATION TEST VER-1A. for damage and repair as necessary. Perform VERIFICATION TEST VER-1A. voltage. Perform VERIFICATION TEST VER-1A. pedal travel sensor. Perform VERIFICATION TEST VER-1A. travel sensor. Perform VERIFICATION TEST VER-1A. sensor plunger cap color matches color dot on booster (near sensor). connector. Repair connector as necessary. With DRB-II in voltmeter mode, probe Red/Dark Green wire (Red/Dark Blue wire on Grand Cherokee and Grand Wagoneer or Red/Brown wire on Wrangler) at ABS pump/motor relay socket terminal "B". If voltage is more than 9 volts, go to next step. If voltage is less than 9 volts, repair open Red/Dark Green wire (Red/Dark Blue wire on Grand Cherokee and Grand Wagoneer or Red/Brown wire on Wrangler) to ABS pump/motor relay. blow), go to next step. If fuse is not okay (blows), perform TEST 15B. and ABS main relay. Perform VERIFICATION TEST VER-1A. ohms, replace ABS pump/motor relay. Perform VERIFICATION TEST VER-1A. for a short to battery voltage. Perform VERIFICATION TEST VER-1A. TEST VER-1A. If resistance is more than 5 ohms, go to next step. connector terminal No. 15 and ABS pump/motor relay socket Gray wire. Turn ignition off. Reinstall ABS pump/motor relay in PDC. relay socket (if installed). Turn ignition off, and go to next step. Grand Wagoneer or Tan wire on Wrangler) for a short to ground. Perform VERIFICATION TEST VER-1A. If resistance is more than 5 ohms, go to next step. 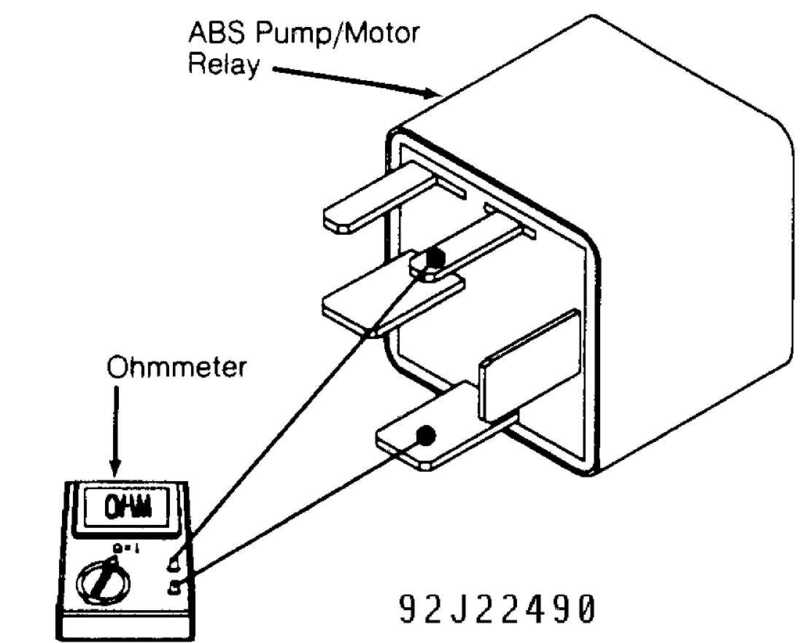 3) Using an external ohmmeter, check ABS pump/motor relay diode. 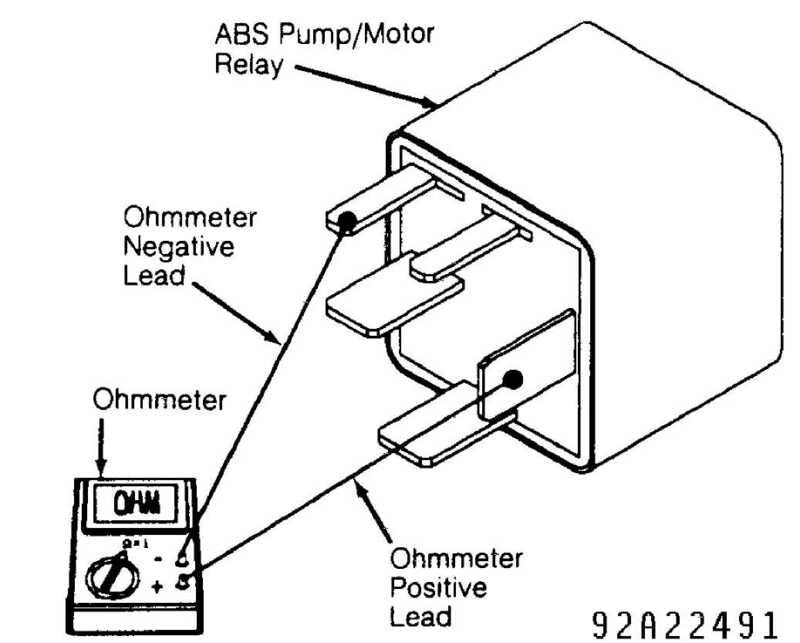 Attach ohmmeter positive and negative leads as shown. See Fig. 17. If continuity exists, replace ABS pump/motor relay. Perform VERIFICATION TEST VER-1A. If no continuity exists, replace ABS pump/motor assembly. Perform VERIFICATION TEST VER-1A. Wrangler) at ABS pump/motor relay socket. 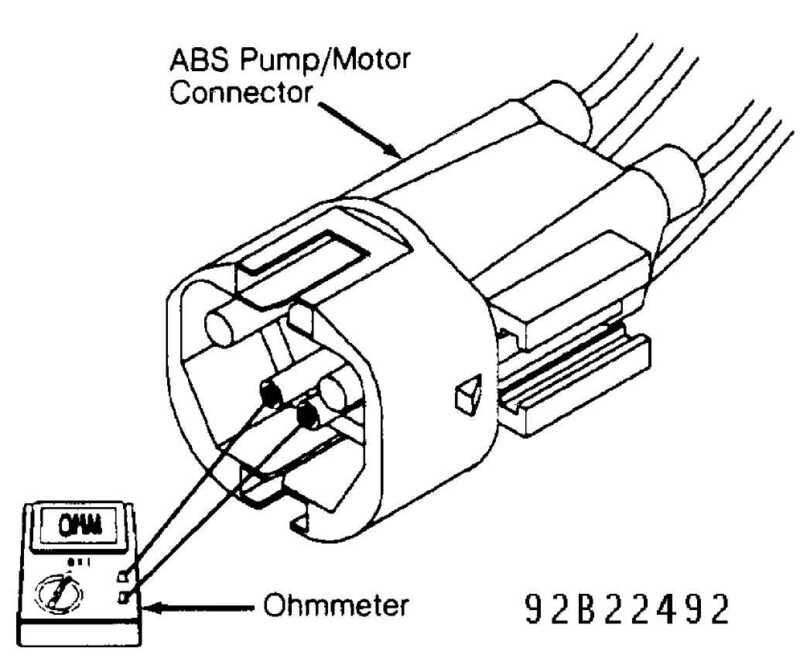 Wrangler) at ABS pump/motor 4-pin harness connector. If voltage is more than 9 volts, go to next step. If voltage is less than 9 volts, repair open Tan/Black wire (Brown/White wire on Grand Cherokee and Grand Wagoneer or Tan wire on Wrangler) to 4-pin harness connector. Perform VERIFICATION TEST VER-1A. 3) Turn ignition off. With DRB-II in ohmmeter mode, probe Black/Tan ground wire (Black ground wire on Grand Cherokee and Grand Wagoneer) at ABS pump/motor 4-pin harness connector. If resistance is less than 5 ohms, replace ABS pump/motor assembly. Perform VERIFICATION TEST VER-1A. If resistance is more than 5 ohms, repair open in Black/Tan ground wire (Black ground wire on Grand Cherokee and Grand Wagoneer). Perform VERIFICATION TEST VER-1A. pump/motor assembly. Perform VERIFICATION TEST VER-1A. present, go to next step. (Brown wire on Wrangler) for a short to battery voltage. Perform VERIFICATION TEST VER-1A. If no voltage is present, go to next step. than 5 ohms, go to next step. No. 49 and ABS pump/motor 4-pin harness connector. If resistance is less than 5 ohms, go to next step. If resistance is more than 5 ohms, repair open ABS pump/motor speed sensor Tan wire (Light Green/Brown wire on Wrangler). Perform VERIFICATION TEST VER-1A. Blue wire (Brown wire on Wrangler) between CAB connector terminal No. 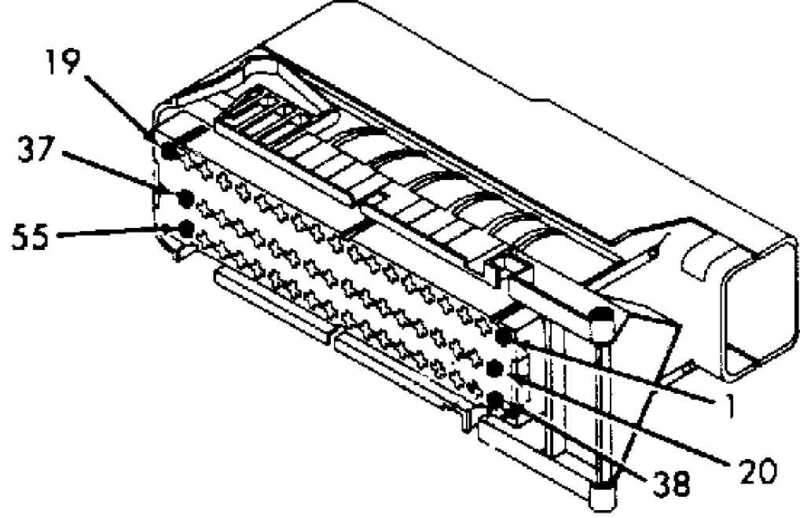 10-pin harness connector. If no voltage is present, go to next step. for a short to battery power. Perform VERIFICATION TEST VER-1A. Wrangler) for a short to ground. Perform VERIFICATION TEST VER-1A. 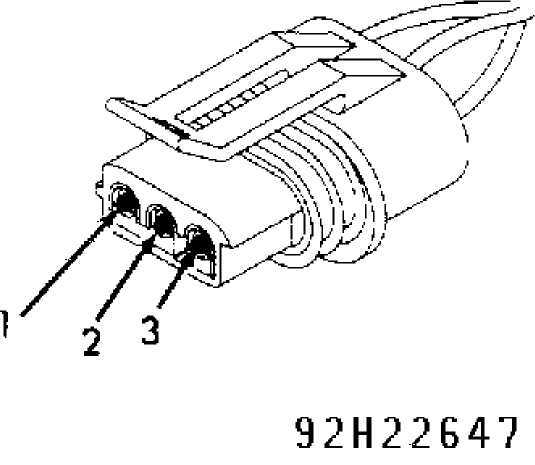 White/Tan wire (White/Orange wire on Grand Cherokee and Grand Wagoneer or White/Yellow wire on Wrangler) between CAB connector terminal No. 38 and HCU 10-pin harness connector. If resistance is less than 5 ohms, go to next step. If resistance is more than 5 ohms, repair open White/Tan wire (White/Orange wire on Grand Cherokee and Grand Wagoneer or White/Yellow wire on Wrangler). Perform VERIFICATION TEST VER-1A. 4) Using an external ohmmeter, measure resistance of right front inlet valve between terminals No. 3 and 5 at HCU pigtail connector. See Fig. 19. If resistance is 5-8 ohms, replace CAB. Perform VERIFICATION TEST VER-1A. If resistance is not 5-8 ohms, replace hydraulic control unit. Perform VERIFICATION TEST VER-1A. connector. Repair connector as necessary. Turn ignition on. With DRB-II in voltmeter mode, probe Dark Green/White wire at HCU 10-pin harness connector. If no voltage is present, go to next step. If any voltage is present, repair Dark Green/White wire for a short to battery power. Perform VERIFICATION TEST VER-1A. than 5 ohms, repair Dark Green/White wire for a short to ground. harness connector. If resistance is less than 5 ohms, go to next step. If resistance is more than 5 ohms, repair open Dark Green/White wire. front outlet valve between terminals No. 8 and 10 at HCU connector. hydraulic control unit. Perform VERIFICATION TEST VER-1A. faults. If RIGHT FRONT SENSOR CIRCUIT FAILURE message is displayed, go to next step. If message is not displayed, perform TEST 19A. replace as necessary. Perform VERIFICATION TEST VER-1A. II in voltmeter mode, probe White wire at CAB connector terminal No. not 900-1300 ohms, go to next step. replace sensor. Perform VERIFICATION TEST VER-1A. for damaged teeth or excessive runout. Runout should not exceed .003"
VERIFICATION TEST VER-1A. If tone ring is okay, go to next step. necessary. Perform VERIFICATION TEST VER-1A. to next step. If message is not displayed, perform TEST 21A. connector. Repair connector as necessary. Turn ignition on. Using DRB-II in voltmeter mode, probe Yellow wire (Yellow/Dark Blue wire on Wrangler) at CAB connector terminal No. 27. If no voltage is present, go to next step. If any voltage is present, perform TEST 20B. (Yellow/Dark Blue wire on Wrangler) at CAB connector terminal No. 27. If resistance is more than 5 ohms, go to next step. If resistance is less than 5 ohms, perform TEST 20C. wire (Yellow wire on Wrangler) at CAB connector terminal No. 45. With DRB-II in ohmmeter mode, measure resistance of Yellow wire (Yellow/Dark Blue wire on Wrangler) at right rear wheel speed sensor harness connector. If resistance is less than 5 ohms, perform TEST 20E. If resistance is more than 5 ohms, perform TEST 20D. On Cherokee, repair Yellow wire for a short to ground. probe Yellow wire of ABS disconnect connector. Wrangler, repair open Yellow wire to right rear wheel speed sensor. Wagoneer, disconnect and inspect Black ABS 8-pin disconnect connector. connector and CAB 55-pin connector. Perform VERIFICATION TEST VER-1A. others, disconnect and inspect Black ABS 8-pin disconnect connector. On Cherokee, connector is located on transmission hump near firewall. between right rear wheel speed sensor and ABS disconnect connector. pin connector. Perform VERIFICATION TEST VER-1A. for damaged teeth and excessive runout. Runout should not exceed .003"
sensor. Perform VERIFICATION TEST VER-1A. 1) Using DRB-II, read ABS fault codes. If any fault codes are present, perform TEST 1A. Turn ignition off. Remove ABS main relay from PDC, and inspect connector. Repair connector as necessary. Turn ignition on. If ABS warning light comes on, go to next step. If warning light does not come on, perform VERIFICATION TEST VER-1C. Wagoneer). Perform VERIFICATION TEST VER-1A. to next step. If any voltage is present, replace ABS main relay. between relay splice and diode. Perform VERIFICATION TEST VER-1A. (Violet/White wire on Grand Cherokee and Grand Wagoneer or Light Green/Orange wire on Wrangler) between ABS warning light and diode. Perform VERIFICATION TEST VER-1A. CAB 55-pin connector. Repair connector as necessary. Turn ignition on. Yellow/Dark Green wire on Wrangler) of CAB connector. Yellow/Dark Green wire (Wrangler). Perform VERIFICATION TEST VER-1A. 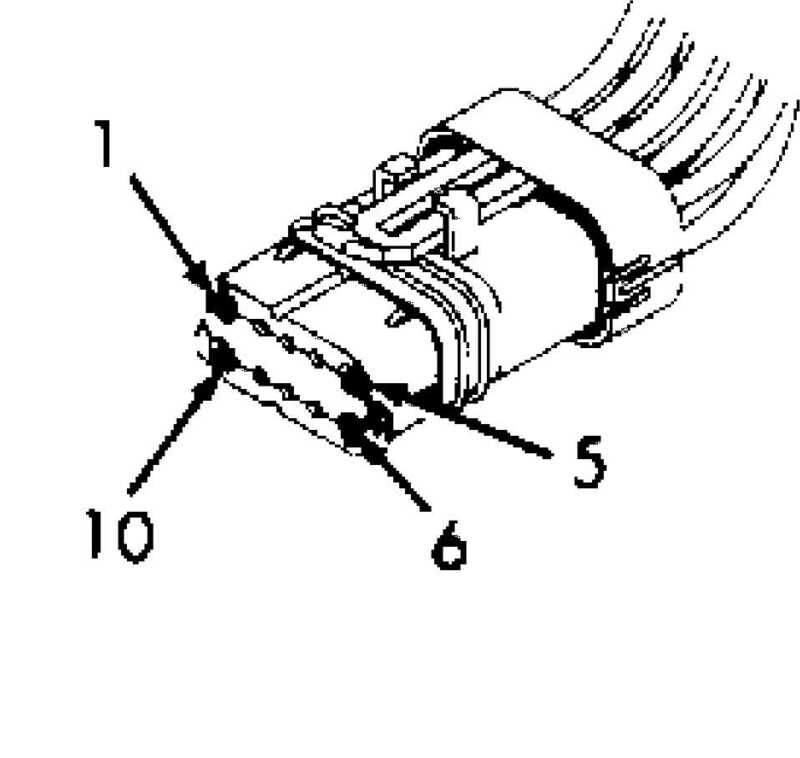 diagnostic connector and No. 23 of CAB connector using an external ohmmeter. No. 42 of CAB connector. White/Black wire (Cherokee), White/Gray wire (Grand Cherokee and Grand Wagoneer) or Orange wire (Wrangler). Perform VERIFICATION TEST VER-1A. If resistance is less than 5 ohms, turn ignition off. Reconnect CAB 55-pin connector. Using DRB-II, try to access ABS TEVES diagnostics. If DRB-II does not display NO RESPONSE, system is functioning properly. If DRB-II displays NO RESPONSE, replace CAB. Perform VERIFICATION TEST VER-1A. Disconnect all previously connected jumper wires. display "G" SWITCH #1 CLOSED, "G" SWITCH #2 CLOSED, perform TEST 3A. actuated, replace hydraulic control unit. Perform VERIFICATION TEST VER-1A. If brake pedal "drop" was felt when valve was actuated, release brake pedal. Depress brake pedal. Using DRB-II, actuate right front outlet valve. actuated, replace hydraulic control unit. Perform VERIFICATION TEST VER-1A. If brake pedal "drop" was felt when valve was actuated, release brake pedal. Depress brake pedal. Using DRB-II, actuate rear outlet valve. VER-1A. If brake pedal "drop" was felt when valve was actuated, road test vehicle for a minimum of 5 minutes and perform several anti-lock braking stops. 7) Using DRB-II, read fault messages. If DRB-II displays any faults, perform TEST 1A. If DRB-II displays no faults, system is operating properly. VER-1A. If brakelights are operating properly, turn ignition off. light is off, repair fused ignition feed circuit to warning lights. and Grand Wagoneer or Light Green/Orange wire on Wrangler) and ground. Green/Orange wire (Wrangler). Perform VERIFICATION TEST VER-1A.